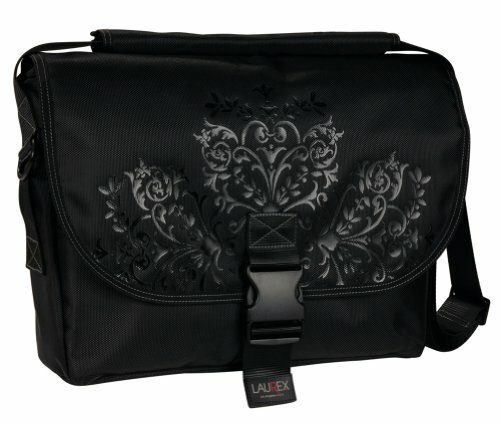 Laurex Medium Size Messenger Bag - Freezia Grove. Black. Medium. Soft, light weight yet sturdy 1680D polyester fabric. Advance slim cutting. Convenient multiple accessory pockets. Large main pocket. Adjustable shoulder strap with comfort patch. Handle on top. Exterior dimension: 17 X 13 X 4.5 inch. Laptop compartment: 15 X 11 X 1.5 inch. Fit most 15.6 inch screen size laptops. If you have any questions about this product by Laurex, contact us by completing and submitting the form below. If you are looking for a specif part number, please include it with your message.